WASHINGTON (AP) - Sen. Orrin Hatch doesn't want to follow his fellow Utah Republican Bob Bennett out of the Senate with the tea party hot on his heels. So Hatch, who's running for a sixth term in 2012, gave the tea party a bear hug Tuesday night during what's believed to be the populist movement's first televised town hall. He has fought for years for the balanced budget amendment that tea partiers demand, he told them, and just like the tea party, he wants to repeal President Barack Obama's health care overhaul. What Congress needs, the Utah Republican suggested, is a fiscally conservative majority - not arbitrarily new blood. 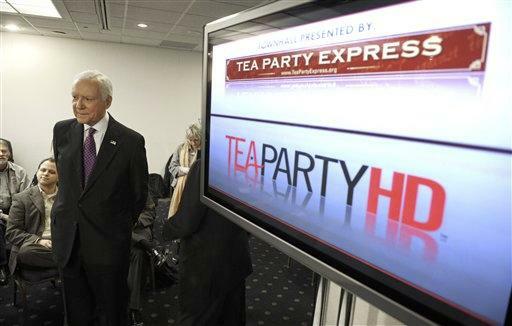 In fact, Hatch, who's been in Congress since 1977, all but declared himself a tea partier. "We don't need a break," Hatch said, when someone suggested one during the 90-minute multimedia town hall session. "We might not look like much, but we're a tough bunch, let me tell you." The tea party wasn't quite ready to return Hatch's embrace. The several dozen people crammed into the National Press Club's conference room were respectful, if not enthusiastic. They gave their loudest greeting to Rep. Michele Bachmann, the House's Tea Party Caucus chairwoman, when she slipped in at mid-meeting. Hatch was the only one of five lawmakers who attended the televised and tweeted event who had not been explicitly endorsed by the populist movement that dominated the 2010 elections. Missing were other senators who could face a tea party-led challenge in 2012, such as Richard Lugar of Indiana and Olympia Snowe of Maine. With Hatch on the podium were the faces of tea party change. Besides Bachmann was Sen. Mike Lee, R-Utah, a tea party darling who was one of two candidates who drummed Bennett out of office by besting him in a party convention vote. There too were Sen. Rand Paul of Kentucky, the first of several early exiters, and Reps. Steve King of Iowa and freshman Allen West of Florida. But Hatch was the first of the five to arrive and the first to speak, his glowing terms a sign of official Washington's acknowledgment that the tea party and its libertarian-leaning agenda, however disjointed, moves election results. Sharing the stage with the others during most of the 90-minute session, Hatch suggested he was a tea partier before there was a modern-day tea party. He pointed out that with the late Sen. Strom Thurmond of South Carolina, he proposed a balanced budget amendment back in the 1980s and again in the 1990s, and stood ready to do it again. Hatch warned that if the government can regulate health care, it can do "anything to you that it wants to." "I for one want to thank the tea party for what they've done," he said. But never did Hatch suggest that the tea party revolution had changed him. Moments after he brushed off the suggestion for a break, the five-term senator left the event to give a television interview.